In Morocco, the Turtle Dove is one of the most popular game by hunters. 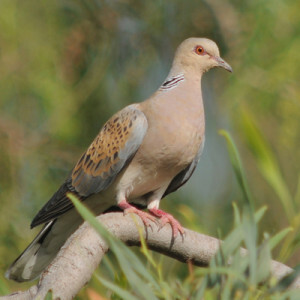 This report deals with the bio-ecology of hunting doves Marrakech Morocco. Migration periods arrival and departure have’re defined, the timing of reproduction was determined, nesting habitat preferences were analyzed in addition to various natural and anthropogenic threats. A 15 Km (minimum) and 50 Km (maximum) reserves of 18,000, 15,000, 12,000 and 8,000 ha. Plains consist of agricultural properties. Hunters are placed on trails or tracks that border the orange groves, olive groves and wheat fields. 4:30 / 5:00 Departure by minibus or road vehicle with driver and hunting guide to the territory. Distribution folding seats and coolers with fresh mineral water and allocation of firing points. Hunting 7:30 to 10:00 and back to the hotel. 3:00 p.m. departure for the last night in another territory (folding chairs, fresh water). Back to the hotel around 7:00 p.m. / 7:30 p.m.